Recently I was in discussion with a friend about snake rescue and we just decided to pen down a list of snake friends in our knowledge that have died due to snakebites. In 30 minutes we could come up with 29 names, there may be additions to this list if we start researching on a serious note. Also, we’ve not included those who’d lost their limbs or had disfigured them due to envenomation. And this we are talking only about western and central Maharashtra. When you look at this list it’s very disturbing. What happened? Mistakes? Carelessness? Accidents? We do not know and I don’t want to go into the details of that. But in the end there is loss of life, there are broken families and worst is the impact on snakes, as after every such case the conservation of snakes is negatively impacted. Many people want to become snake friends. It’s so easy, just start catching snakes, and there you became a snake friend. Is there any need to catch them? How do you do it? What precautions do you take? What you do with the snakes after they’re rescued? How many times do you handle it to show off? Nothing matters, except that if you are able to catch a snake you become a ‘snake friend’ (sarp mitra). Please take a look at the list above, the magnitude of responsibility it carries to become a snake friend can be clearly seen. ‘Rescue’ by definition (here) means saving an animal from an adverse situation and rehabilitating it back into its natural environment. Unfortunately most ‘rescues’ do not fit this definition. In several/ most cases, the snake is just moved from one stressful situation to another, or (often) an area outside its original ‘home range’. When we talk about ‘rescue’ we really should be thinking about what’s good for the snake and not us. Do you think taking a snake from one environment where it is actively foraging/ living and dumping it into a new environment is rescue????? Do you think capturing a snake from an adverse situation and then using it for live shows for ‘education’ is rescue????????? Do you think handling, kissing snakes and showing off your images on social media is rescue?????? If you answer all the above questions in positive, then, are we really doing snake RESCUE???????? That’s where the shift needs to take place in our minds and we should rethink the term ‘rescue’ and use it so as to suit the welfare of the snake. Around two decades back there was a dire need to create a positive image of snakes in our community and during those days there was a lack of digital media for communication, which is available today. Therefore, during those days, showing off your snake handling images or doing live snake shows had a positive impact to create a whole line of people who started conserving snakes and making efforts to get this group of animal kingdom to a respectable level. In today’s world, our snake conservation efforts should move away from snake handling, snake shows and catching them to creating a society for co-existence, reduction of snake bites and fatalities and more focus on researching about the species. 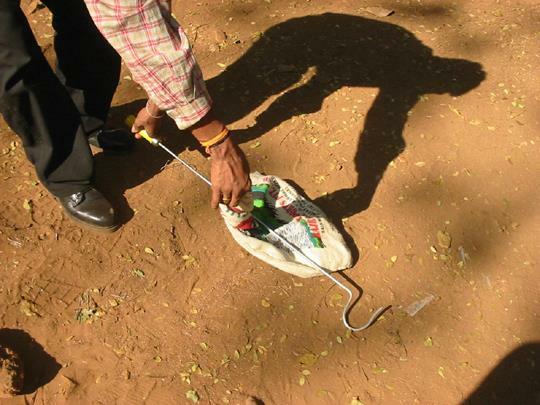 One simple SOP, which you can follow for snake rescue work, is given below. There can be an inclusion of more points depending on the situation. Identify the need for rescue – Rescue only when unavoidable. Get acquainted with safer bagging techniques. Always work in pairs when possible. Minimize the handling of a snake; twice per snake only – once while bagging and once while releasing. Avoid all unnecessary handling. In case of injuries to snakes or transfers to another bag/ box, handle with care and again do it only if absolutely necessary. If the snake is fit for release, then do it without any delay (ASAP). Keep records of rescue (bagging to release) – Submit it regularly to the Forest Department. Get acquainted with First aid, and always carry a ‘SAFE SNAKES’ card which has information about the nearest hospital, relative’s number and personal details like blood group, past history of bites (any anti-venom sensitivity) and if possible, contact number of some expert medical professional for guiding doctors about the latest treatment protocol, nearest Forest Department office number & Police station’s number. To attend regular refresher’s course in identification and rescue techniques (once a year – which can be organized by inviting experts). Live snake shows for whatever purpose. Handling snakes when not needed. And without showing any disrespect to those snake friends who have lost their lives (some of them were close friends) I would like to say, – if you still feel that snake handling is a glamorous thing and you will get popularity by excessive handling, showing off, not following procedures or making mistakes your name might (tragically) make it to the list above. Hi kedar, very nice article indeed. I have been doing snake Rescue since last almost 9-10 years following almost all the ethical norms you have listed above. I just want to defend on one point though,about putting the snake out of its home range after the rescue. Theoretically its definitely a wrong thing but in these years I haven’t met a single person who would allow to release the snake in same area even after convincing them that its non venomous. So it becomes a no choice situation,and considering rapid rate of urbanization its getting more and more difficult to find a place nearby where its found. Otherwise I agree all other points you have mentioned. Hi Pushkar, Once you catch the snake then that challenge comes, that’s why we should catch snake only as last resort. Also at this moment we don’t know species specific home range. But most of the time we release it 2-5 kms away , in some cases even 40-50 kms , those should be avoided. there is always a choice, you have taken responsibility of saving an animal so you need to do efforts to look at its welfare. I agree with you its not possible always, but try to minimize it. Usually for non-venomous snakes releasing them within a 400-500mt distance is more than enough and with proper education it seems like many people don’t mind having non-venomous snakes in their gardens as a control for rodent population. I would like to add one more point in release protocol: During summers many places in Maharashtra daytime temperatures cross 40Deg C and ground temp can be as high as 60deg C. In such conditions snakes enter houses to get away from heat and during summers releasing the snake in late evening near the spot of rescue would be helpful as otherwise it’s quite possible the heat can kill the snake. P.S: Nice write up. Ill share it where ever i get a chance. Dude very nice article…… Plz be in contact n do msg/call me . we (Nature conservation society) do this all stuff from last many years. Very well explained article. In case of releasing snake in the same locality, we try to follow the norms. In case of nocturnal species like krait n Russell’s viper we release them in same location (50-200mts) during same night of rescue. Otherwise yes it is very difficult to release snakes in the same area. Indeed a very good article. It is important i think to have information about snake rescuers in the nearby area in urban societies so that they can call for help. One of the biggest nuancens is photographers. I feel questioning the photographer many a times to check how they have taken a pictures. People like You should organize some program about this for the benefit of urban citizen. May be in schools or societies or at least on social media. The message and it’s implication is clear.Keep it up. I agree with many points that have been suggested here By You Mr Kedar Bhide, and by many who know what they are talking about in response. One question though. If the so called “snake rescue” is being carried out with the primary intention of rescuing the reptile, and the people concerned do not see the sense in releasing it within its home range, is there anything wrong or unethical in releasing it when they do not know?? If money is not charged, and they do see you its not an issue and its not like they can blame you of setting up another scenario where you could make a quick buck. And if this is not possible why even “RESCUE” the snake?? It seems that we are inevitably rescuing the people from their fear which is uncalled for in the first place. You rightly said it, many a times we rescue people from their fear of snake than rescuing snake !!!. thats what happens many times. About releasing snake in home range. We are very data deficient species wise on its home range. So both ways its bit grey area. I will not go into ethics and wrongness at all at this stage. Those who do not know and doing it can take whatever ground they want to take. About money being charged and releasing it in same area so more money can be made is criminal and not rescue at all. About why even rescue a snake? yes if there is no need then just leave it there thats a better way. Good write up. In most of the cases, people are constantly invading the territory of wild animals including snakes. So, it is quite natural for a snake to get into any house. Though, usually they get into our places for some reason, be it in search for food or in search for comfortable temperature as Chaitanya mentioned. Why relocate a snake when it has entered my place to catch a mouse? I find no reason in that! Hope some snake friends will take lesson from the database of snake friends deceased in the line of duty. Good job done as an educator. Article is really superb n helpful to us. अर्धवट माहीतिने व चुकीच्या पध्द्तीने साप हाताळणारे सर्पमित्रांना हा लेख दिशादर्शक आहे. Very hard-hitting and thought provoking post, Kedar. Admirable that your thinking on the topic is very grounded in today’s needs and realities. I’ve read Gerry Martin exhorting people to “rescue” only to the extent of moving the snake outside the front door and releasing it, whether venomous or not. There was a discussion on this very topic in my office Yammer forum couple days back. Very timely post, will share it there. Good work! Great article giving inside of snake rescue. I have seen on jungle trails, Many or i should say most of youngster who learned handling snake gets some sort of addiction. Any snake they see – irrespective of that poor snake needs rescue or any help- is been caught. Hope all snake lovers & handlers take first lesson that there are two precious life involved handling snakes. There is neither a game nor a fame. One has to be very careful & clear about if its really required. Hope you publish this article in wider scale like newspaper for benefit of more & our snakes too. Indeed , a well thought article !! Dear Sir I want to learn how to catch Snakes to rescue and for their saftey. Where I can get training in PUNE. I have great affinity towards animals. I have seen that due to fear people kill innocent animals like snakes. I want to learn how to rescue snakes but I have no knolwedge of handling snakes and how to rescue them. Is their any trainer in Pune. Hi Sudhir, Try approaching Pune snake park at Katraj. Excellent effort. I do agree with all the protocols. Since I got to know about all these basic fundamentals through my mentor Mr Gerry Martin couple of years back I have gone through handfull numbers of rescues followed by release activities including highly venomous to non-venomous species. Only in very few cases I was strongly opposed by the local (Dumb) inhabitants where I was unable to release the snake within hundred meters of the rescue site, but still within 200-250 meters only. In rest of all the cases I actually focused on generating awareness to the utmost level which led them to decide ownself about releasing the snake within 100 meters only selecting the site with their choice. And I’m happy that I have succeeded. What I noticed is that if we can boost the confidence on them about the snake of not returning back using scientific references and common examples, it works a lot. In almost every cases, the locals only guided me to reach the best releasing location within 100 meters only if not even within the same premises of the rescue site in some cases. For that I grew confidence on myself first and in none of the cases in last 6-7 years I got a repeat call on the same snake ever. It truly works and many of my senior friends here with much more experiences would surely agree with me that’s for sure. Also, I feel, to be a good and ethical rescuer, one has to go through training of a good mentor which is actually lacked by these unethical rescuers. Is there any licence for snake catchers or any training. I have rescued more than 1000 snakes till date but i dont have any deep knowledge. I also dont have any tools i catch with my bare hands. Pls let me know if there is any licence or traing for snake friends like me. I am from kolhapur. Hello Sir! The above-mentioned information was very helpful for us begginers. I am totally an snake enthusiast and I really hope to have a thorough knowledge in snake rescuing and handling. Being in Pune I have volunteered at Snake Park or 2 months already. But I haven’t had a chance to learn about the rescuing as such. I would really like to know is there any place else in Pune or surrounding Pune where learning about snake rescue is possible. Hoping to here from you soon. Thank you!